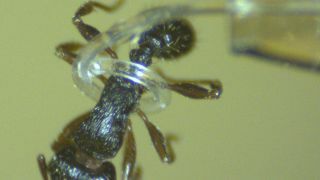 A team of US engineers has developed a robot with a soft tentacle that can grab tiny objects like ants and hold onto them without hurting them. That sounds like the doings of bored engineers with too much time on their hands, but this could actually be used for microsurgery. The tentacle consists of a very small tube made out of rubbery plastic from which air can be pumped in and out. That pneumatic action allows it to curl itself into a circle with a radius of just 200 micrometres - about the size of dust particle, and far less than existing tentacle-bots which are at least a centimetre in size. Its gripping force is just 0.78 micronewtons, and during experiments the tentacle was able to safely grab hold of an ant, as well as a particular type of fish egg that normally deforms and bursts easily when handled using hard tweezers. As well as being useful for manipulating fish eggs and corralling ants, it's hoped that the tiny tentacle will have applications in microsurgery - allowing it to pass down blood vessels before grabbing an object. Details of the discovery were published in the journal Scientific Reports.